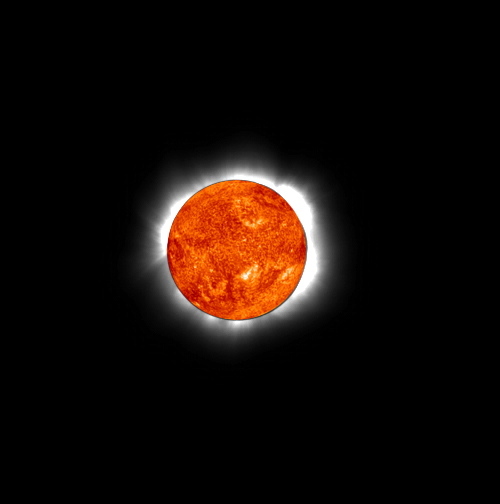 Composite image from August 11 total solar eclipse with SOHO EIT image of the solar disk superimposed on coronal features photographed by the Williams College Eclipse Expedition. Composite image with EIT solar disk scaled by 75% to show correspondences between solar disk and inner coronal features. Processing by Wendy Carlos of eclipse photographs by Jay Pasachoff. � 2000 by Wendy Carlos and Jay M. Pasachoff. SOHO EIT images courtesy of the EIT team at NASA Goddard Space Flight Center, combined by Wendy Carlos. The August 11 total solar eclipse, visible from a narrow path extending across Europe and as far as India, provided wonderful overlapping observations from the ground and from space. Features in the sun's corona were traced from lower to greater heights using joint observations from space by scientists at NASA's Goddard Space Flight Center and the U.S. Naval Research Laboratory (NRL) from the ground at the August 11 total solar eclipse by Williams College scientists. Space observations from the Extreme-ultraviolet Imaging Telescope (EIT) on the Solar and Heliospheric Observatory (SOHO) show the sun's hot outer atmosphere, the corona, silhouetted in front of the Sun and extending slightly outward. Eclipse observations, which are possible to make only every eighteen months or so when a total solar eclipse crosses the Earth's surface, are able to extend those observations to greater heights above the Sun's everyday surface. The Large Angle Spectroscopic Coronagraph (LASCO) , on SOHO observes the outer corona. NASA Goddard, NRL, and Williams College scientists took advantage of this year's total eclipse. The result can improve scientists' understanding about how the Sun's magnetic field shapes and guides gas that leaves the Sun, some of which eventually envelops the Earth. The EIT experiment on SOHO is headed by Joseph Gurman of NASA's Goddard Space Flight Center, Greenbelt Maryland. SOHO is a mission of international cooperation between ESA and NASA. The SOHO EIT instrument was developed by an international consortium led by Principal Investigator Dr. Jean-Pierre Delaboudiniere of the Institute for Space Astrophysics at the University of Paris - South in Orsay, France. Russell Howard of NRL is Principal Investigator of LASCO. EIT obtained an image of the Sun just four minutes after the eclipse ended in Rimnicu Vilcea, Romania, where the Williams College team was stationed. The Williams College team, from Williamstown, Massachusetts, was headed by Jay Pasachoff, Stephan Martin, and Bryce Babcock, supported in part by a Guest Investigator grant from NASA. After two weeks of setting up a portable observatory in Romania, with several experiments weighing more than a ton of telescopes, electronics, and computers, the eclipse team observed two minutes and 23 seconds of totality in completely clear skies. Williams students and faculty will be working further on this image and on other eclipse data in the months to come. The eclipse data overlap not only the EIT observations on their inside but also, at their outside limit, other SOHO observations of the outer corona from the Large Angle Spectrographic Coronagraph (LASCO), and eventually a composite image will cover the whole range of the corona as it appeared on the day of the eclipse. "Complete and total success" reported Prof. Jay Pasachoff of Williams College, Williamstown, Massachusetts, of his team's observations of today's total eclipse, August 11. 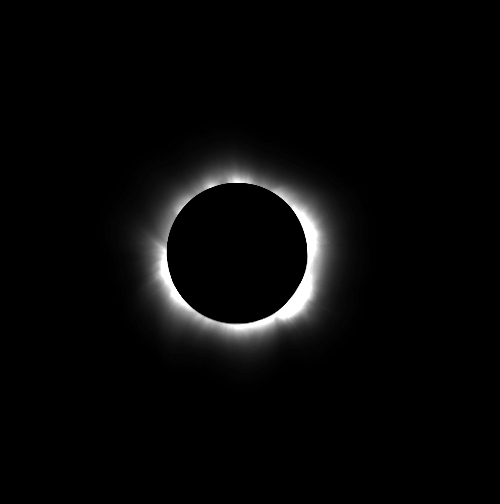 "From our site in Rimnicu Vilcea, Romania, we viewed the two and a half minutes of totality in a completely clear sky. We have already played back data from our hard drives, and we can see that we have fabulous scientific data. It should keep my students and me busy for years. "We have had a dozen Williams students as well as some faculty and staff on site in Romania for the last two weeks. They have set up and aligned some ton and a half of equipment. It all paid off with today's magnificent results. "We are studying the outer part of the sun, the corona," reported Pasachoff. The corona expands to envelop the Earth, so by studying it we are studying our environment in space. This year and the next two are especially active times for sunspots and other tracers of the sun's magnetic field, so the corona was not only especially interesting but also especially beautiful this time. Bright streamers bristled from the Sun in all directions and red prominences gleamed out at the Sun's edge. "Our experiments were meant to study how the corona gets so hot, how its temperature changes from point to point, and how the magnetic field shapes it. The National Science Foundation, the National Geographic Society, and NASA, which funded the bulk of our expedition, should be very happy with us." We have twelve Williams College students, exchange students, and recent alumni with us. Bryce Babcock and Stephan Martin of Williams College, Lee Hawkins of Wellesley College and Appalachian State University, Jonathan Kern of Caltech, Allan Ridgeley of the Rutherford Appleton Laboratory in England, Marek Demianski of the University of Warsaw, and Paul Rosenthal of Williamstown comprise our staff." Dr. Ridgeley reports that his colleagues in Cornwall, though they observed the eclipse through clouds, were able to record the infrared spectrum of the corona. Two members of the Williams College team were stationed at the Bucharest Observatory to try to make high-resolution observations of the corona with a 6-m focal length telescope. Unfortunately, a cloud covered the sun just at the wrong moment, and totality was obscured from this particular Bucharest site, though the eclipse was visible from various locations in Bucharest. Observing his 29th solar eclipse, Prof. Pasachoff is Field Memorial Professor of Astronomy, Chair of the Astronomy Department, and Director of the Hopkins Observatory at Williams College. He is also Chair of the Working Group on Eclipses of the International Astronomical Union. He is the author of the Peterson Field Guide to the Stars and Planets in addition to astronomy texts, with Dr. Bryce Babcock, staff physicist at Williams College. Scientific staff also includes Lee Hawkins of Wellesley College, now at Appalachian State University; Stephan Martin of Williams College; and Jonathan Kern, Optics Scientist at the Laser Interferometer Gravitational-Wave Observatory of Caltech. The expedition brought with it about 3000 pounds (a ton and a half) of telescopes, optics, computers, and other equipment, and was located at Ramnicu Valcea, about 170 km west of Bucharest. The eclipse site was on the sixth story roof of a hotel, which provided not only a good view but also security, electric power, and facillities. 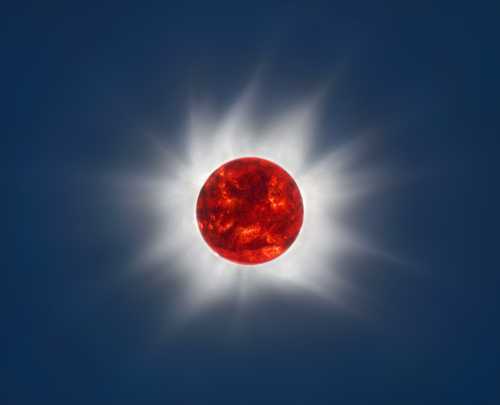 Pasachoff also advised Dr. Magdalena Stavinschi, Director of the Astronomical Institute of the Romanian Academy of Sciences in Bucharest, and her staff on the use of some of their large telescopes during the eclipse to make high-resolution observations of the solar corona. Two of the experiments deal with the still open question of how the corona, the outermost layer of the sun's atmosphere, can reach a temperature of 2 million degrees Celsius (about 4 million degrees Fahrenheit), even though the everyday surface of the sun below it is only 6,000 degrees Celsius (about 11,000 degrees Fahrenheit). The third experiment is in liaison with scientists in charge of an experiment on the Solar and Heliospheric Observatory (SOHO) spacecraft. The experiments are in collaboration with Dr. Bryce Babcock, staff physicist at Williams College. 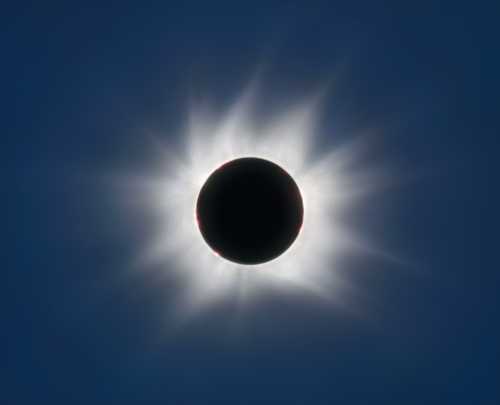 The observations are possible only during the brief minutes of a total solar eclipse, when the everyday sun is hidden by the moon, allowing the faint corona to be observable from earth. On ordinary days, the corona is hidden by the blue sky, since it is about a million times fainter than the layer of the sun we see shining every day, the photosphere. Pasachoff, together with Dr. Leon Golub of the Harvard-Smithsonian Center for Astrophysics in Cambridge, Massachusetts, is coauthor of the first textbook about the solar corona to be written in decades; it was published in 1997. The first experiment is a search for rapid oscillations in the corona, with periods of about 1 second. Pasachoff and his colleagues have developed techniques over the last two decades to observe in the so-called "coronal green line," a color in which the corona emits light especially strongly, with time resolution so fast that such short periods can be detected. Oscillations with periods in that short range are predicted by some theories that hold that the extreme coronal heating is caused by vibrations of magnetic loops. The loops of gas, held in place by the sun's magnetic field, have been observed, and the question is whether their vibrations bring enough energy into the corona to heat it sufficiently. The experiment is supported by a grant from the Atmospheric Sciences Division of the National Science Foundation. The sites at which they looked on the edge of the sun was the one that NASA's Transition Region and Coronal Explorer spacecraft, on which Golub is a principal investigator, imaged at extremely high spatial resolution at the time of the eclipse. The second experiment is a map of the temperature of the corona, using a technique of comparing electronic images of the corona taken at special ultraviolet wavelengths. Following theoretical work, these wavelengths are chosen to include two such at which the difference between the shape of the everyday sun's spectrum and the corona's spectrum is especially striking. The experiment is supported by grants from the Committee for Research and Exploration of the National Geographic Society. The third experiment is to image the solar corona during the eclipse to compare with observations of the corona seen with the Extreme-ultraviolet Imaging Telescope (EIT) on board the Solar and Heliospheric Observatory (SOHO), in collaboration with scientists at NASA's Goddard Space Flight Center. The features seen at the eclipse outside the solar disk will be matched up with their bases seen on the disk with the EIT experiment. Further, the experiment uses a lens that gives an image at the same scale and with a green filter that matches a filter in one of the telescopes in the coronagraph system on SOHO; this telescope was operable during the 1998 eclipse though is no longer working. This observation was in collaboration with the late Dr. Guenter Brueckner of the Naval Research Laboratory in Washington, D.C., principal investigator of that experiment, LASCO (Large Angle Spectrographic Coronagraph), and is now in collaboration with Dr. Russ Howard and other scientists at NRL. Stephan Martin of Williams College is the collaborating staff member. The experiment is funded by a grant from NASA's Guest Investigator Program for the SOHO spacecraft. An unusual aspect of Pasachoff's experimental teams is that they include so many undergraduate students. They include Williams College students Kevin Russell, Sara Kate May, Rebecca Cover, Daniel Seaton, Joey Shapiro, Misa Cowee, Darik Velez, and Rossen Djagalov; Keck Northeast Astronomy Consortium Summer Fellow Alexandru Ene, a student from Romania who studied at Middlebury College and who is transferring to Harvard; and probable future Williams student Mark Kirby, from Deep Springs College in Dyer, Nevada. Recent Williams alumni Timothy McConnochie '98 of JPL, Pasachoff, and Christina Reynolds '97 of the University of North Carolina are also on site. Dr. Allan Ridgeley of the Rutherford Appleton Laboratory, England; Prof. Marek Demianski of the Copernicus Astronomical Center in Warsaw; Mitzi Adams of the NASA Marshall Space Flight Center, and Paul Rosenthal joined the group in Romania. Student participation in the expedition is funded by the NSF, National Geographic, and NASA grants; by the Keck Northeast Astronomy Consortium; by the Massachusetts Space Grant, which is funded by NASA; and by the Safford Fund and the Brandi Fund at Williams College. A collaboration among Williams College, the Rutherford Appleton Laboratory, and the Astronomical Institute of the Romanian Academy of Sciences is funded by NATO. The next opportunity to obtain such images will come on June 21, 2001, when a total eclipse of the Sun crosses southern Africa. Leon Golub and Jay M. Pasachoff, Nearest Star: The Surprising Science of Our Sun (Harvard University Press, in press, 2001). Leon Golub and Jay M. Pasachoff, The Solar Corona (Cambridge Univ. Press, 1997). Jay M. Pasachoff, 1973, "The Solar Corona," Scientific American 229, #4 (October), 68-79. Donald H. Menzel and Jay M. Pasachoff, 1970, "Solar Eclipse," National Geographic 138, #2 (August), 222-233. Jay M. Pasachoff, 1992, "The Darkness That Enlightens," National Geographic 181, #5, 36-37. Professor Jay M. Pasachoff, Williams College--Hopkins Observatory, Williamstown, MA 01267. This movie shows the moon's shadow as it crosses the earth at nearly two thousand miles an hour. The larger shadow is the penumbra and the smaller one is the umbra. A total eclipse of the sun is visible only from locations within the umbra. People located within the penumbra will see a partial eclipse. This movie was created by Stephan Martin using RedShift 2 (Maris Multimedia). Note: parts of this material is based upon work supported by the National Science Foundation under Grant No. 9812408.